Birthday traditions are so much fun! Every year I like to give my niece and nephew a special gift to be open right before bedtime on their birthdays. Birthday celebrating often means a later than normal bedtime and a kiddo who has a hard time winding down. I like to help the transition to birthday dreams with a gift of a new book, pajamas, and a bath surprise to help make the transition to bed an easier one. I like my gifts to match the theme of the birthday. It's lots of fun to see what I can come up with. I like it when I can find a tooth brush or bath toy related to the party theme. I can be sure that even if I don't find an appropriate tooth brush or bath toy that I can make a washcloth to match the theme. 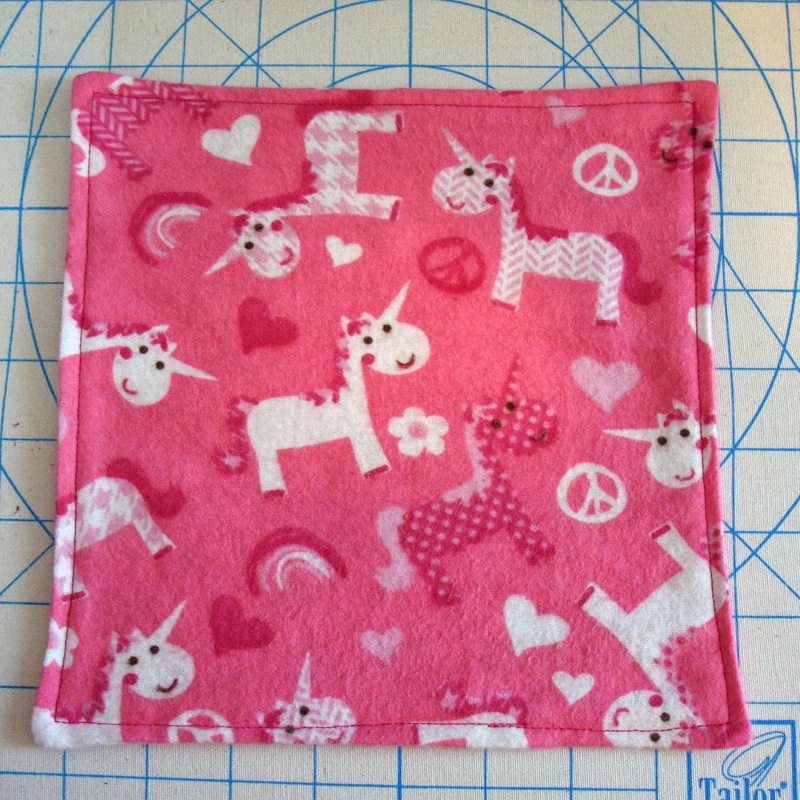 This year Ladybug plans to have a unicorn party so as soon as I saw some unicorn flannel for sale I bought a bit for a washcloth. I'm still on the look out for pajamas and a book, but I am happy to have her washcloth ready. I would love to hear any unicorn book recommendations that you might have. I stated making making Bug washcloths with extra bits of fabric leftover from making him receiving blankets. They are still useful many years later. 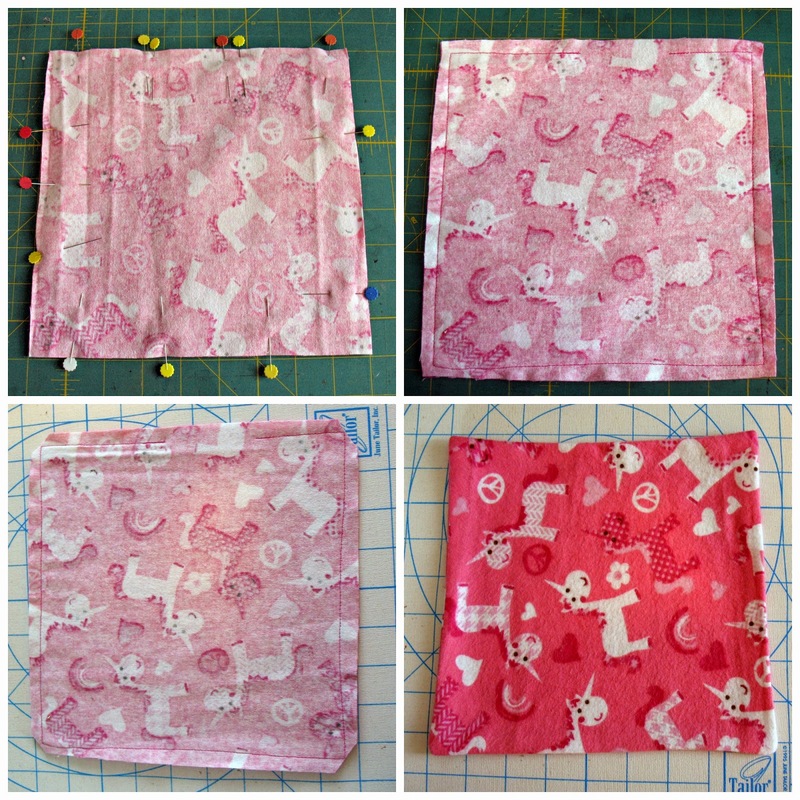 The flannel washcloths aren't as thick as terrycloth ones so they are easier to use and dry more quickly. It can be a fun game guessing which washcloth will be in the tub on any given night. They are a super quick project. I usually make them 9 or 10 inches square.